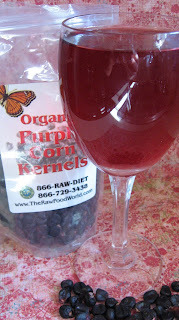 Another fun find from The Raw Food World was Purple Corn Kernels. I originally purchased them with the intent of making blue corn chips, however, discovered just how potent these lil kernels are. What makes purple corn such a beautiful, deep shade of purple is a pigment called anthocyanin, one of the most active antioxidant substances in the vegetable world. —Facilitating tissue regeneration, helping to heal wounds and slowing down aging. —Inhibiting abnormal cell reproduction, thus helping to prevent certain skin and colon cancer. In order to transform these lovely kernels into yummy blue corn chips, I soaked them overnight. (4 oz of kernels in a 32 oz. jar of water). The kernels are so loaded with this purple pigment that it leeches into the water, and by drinking this water or using it in food preparation, you can enjoy the benefits of this powerful antioxidant. Apparently, you can soak the kernels, use the water, and re-soak multiple times, gathering the purple water each time. 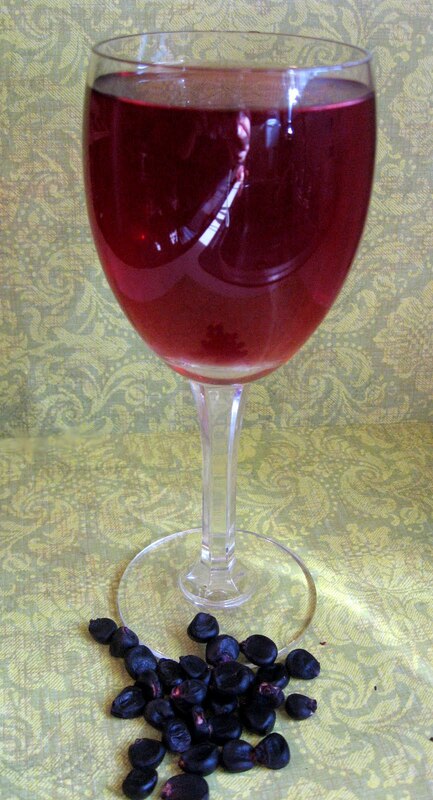 The picture above is the gorgeous, magenta colored liquid that came from my first soak. Some of this water went into my smoothie this morning, and the rest of it is mixed with water in my drinking bottle. I'll be sipping it all afternoon. I refilled the jars of corn with new water, and will let them soak another 8-10 hours before I retrieve the second batch of water. Tomorrow, I'll go ahead and use the actual kernels for chips. The Raw Food World also carries purple corn extract, which is may be more convenient, more potent, and easier to use. How very beautiful it is..Can't wait now until mine arrives.. Isn't it pretty? I did also grind some in a nut/spice grinder. It worked fine, ground to a nice fine powder. Can't wait to make the blue corn chips! Wow! What an interesting and potent source of anthocyanin! I bet you can do tons of different things with purple corn, can't wait to see what else you come up with. I'm sure you can do many things with this water. I used it in smoothies for my boyfriend. NOTE TO FRIENDS WITH IC: I sadly found the purple corn water irritated my bladder causing more severe IC symptoms, so go easy on it and see if it works for you.